Desert Hills 3 West is a 55+ community in Green Valley, Arizona. It consists of attached homes located just west of Interstate 19. As part of Green Valley Recreation, homeowners enjoy access to an envious lineup of amenities and full calendar of activities. The affordable home options within Desert Hills 3 West allow residents to enjoy low-maintenance homeownership in a warm climate with scenic views. Owning a home within Desert Hills 3 West comes with a Green Valley Recreation (GVR) membership. The reasonable GVR dues include access to all 13 recreation centers scattered throughout Green Valley. Members have full use of the many multi-purpose and meeting rooms, ballrooms, and hobby studios. There are also fitness centers, outdoor sports courts, plus more to keep a healthy and active lifestyle. Located just up the street on South Camino Del Sol, one of the GVR centers is right within walking distance from Desert Hills 3 West. 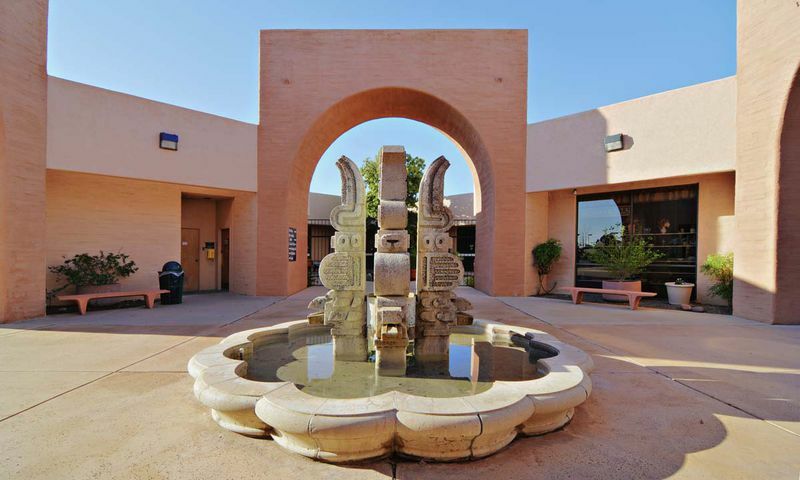 The Desert Hills Social Center includes meeting rooms, an auditorium with a stage, catering kitchen, art studio and gallery, lapidary studio, ceramics studio, and billiards. Residents never have to travel far for an invigorating workout because the Desert Hills Social Center includes a fitness center, outdoor pool, four tennis courts, and shuffleboard courts. Desert Hills 3 West consists of about 170 attached homes developed in the early to mid 1980s. These residences are ideal for active adult homebuyers with ranch-style floor plans that range in size from approximately 900 to 1,200 square feet. These affordable resale homes typically include two bedrooms and two bathrooms. Parking is provided with an attached carport. Residents of Desert Hills 3 West live a vibrant and carefree lifestyle. GVR s recreation centers host over 60 clubs, activities, and classes that meet on a regular basis. Year-round activities include chess, poker, swimming, exercise classes, and crafts. There are over a dozen clubs based on common interests and activities like state clubs, dance clubs, card clubs, and more. Activity directors always make sure that residents have something fun to look forward to by planning trips and tours or annual parties. Whether you re a sports-minded, social butterfly, or education-focused individual, the GVR organization will have something that meets your unique lifestyle. Green Valley, Arizona is a census-designated area in Pima County that is dedicated to age-restricted or age-targeted communities. The majority of residents throughout Green Valley are 55+ active adults. Situated just below the Santa Rita Mountains, homeowners enjoy picturesque views, outdoor recreation, and a year-round warm climate. Homebuyers will be happy to know that Tucson and the University of Arizona are both a short drive away, providing entertainment options and medical facilities. Easy access to Interstate 19 makes it a breeze to travel even farther as Tucson International Airport is just a 30-minute drive. With so much to do with friends and neighbors throughout Green Valley, Desert Hills 3 West is a great option for active adult homebuyers in Southern Arizona. There are plenty of activities available in Desert Hills 3 West. Here is a sample of some of the clubs, activities and classes offered here. Desert Hills 3 West consists of about 170 attached homes. These residences are ideal for active adult homebuyers with ranch-style floor plans that range in size from approximately 900 to 1,200 square feet. These affordable resale homes typically include two bedrooms and two bathrooms. Parking is provided with an attached carport. Please Note: Floor plans are not available at this time. I bought a small place here last year because it was within my tight budget and the location is good for me. I can walk to the DH Social Center and when I want to do something different there are tons of other amenity centers to choose from. It's really convenient when I'm out and want to meet up with friends at another destination - we have plenty of options. There is alot going on, the community is clean and the people here are nice. 55places.com is not affiliated with the developer(s) or homeowners association of Desert Hills 3 West. The information you submit is distributed to a 55places.com Partner Agent, who is a licensed real estate agent. The information regarding Desert Hills 3 West has not been verified or approved by the developer or homeowners association. Please verify all information prior to purchasing. 55places.com is not responsible for any errors regarding the information displayed on this website.